Sweet and creamy-smooth or intensely dark and rich, chocolate is pure sensual pleasure. Its blissful taste inspires feelings of satisfaction and comfort, and scientific research gives us even more reason to be passionate about chocolate: it’s a source of some terrific nutritional benefits when enjoyed as part of a varied, balanced diet. In addition to being delicious treats, there is growing evidence that real, high-quality chocolate and cocoa contain healthful polyphenols, including the type called flavonoids. Polyphenol compounds (found in red wine, tea, apples, oranges, and various vegetables) act as natural antioxidants in the body, protecting it against disease and damage caused by free radicals. Dark chocolate bars with higher percentages of cocoa or chocolate liquor (made exclusively from ground cocoa beans) offer the most nutritional benefits—and more intense flavor. One 1.5-ounce (42.5 gram) chocolate bar contains the same amount of total phenolic compounds as a 5-ounce (148 ml) glass of red wine—which is to say, a lot. More good news about chocolate! Research seems to indicate that eating dark chocolate might play a role in heart health, too. While the verdict is still out, eating high-quality chocolate seems to offer useful nutrients that help improve circulation and lower amounts of LDL (“bad”) cholesterol. 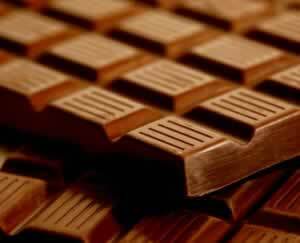 Flavonoids or antioxidants in cocoa and dark chocolate may inhibit platelet activity, an effect that might help prevent heart disease. Compounds in chocolate also seem to increase HDL (“good”) cholesterol levels and protect against the oxidation of LDL cholesterol, effects that might help prevent artery-clogging plaques. Judith H. Dern is an independent, Northwest-based writer who writes primarily about culinary subjects and adores dark chocolate.